In our digital economy, it becomes important that our children learn to create, to love learning, to have integrity, to foster critical thinking, and to be active citizens. It’s become commonly understood that our current culture for our US school system doesn’t always foster these key qualities. I wanted to introduce you to Seymour Papert who has presented potential solutions to making sure creativity, curiosity, and personalized learning become central parts of our learning culture. In reading some of his work, Seymour Papert challenges us to focus on improving the ways kids learn. He deemphasizes the craft of providing explicit instruction to students. In his career, he promoted the insight that students learn most profoundly when challenged to make constructs linked to the learning subject. On a personal level, I find Seymour Papert’s ideas profound because I really didn’t like math in school. It’s a wonder that I ever got a degree in computer science. I credit my personal success to my parents, wonderful teachers and their caring support. I also believe that my desire to write video games fueled my motivation for learning. Learning about vectors in calculus is profoundly more interesting when you figure out that you can use those ideas in making 3D video games. Learning about logic is the cure for insomnia. The ideas of logic come alive when you’re challenged to design the brain of a computer creature in a game. In the following TED Talk, Dr. Gary Stager, author of the book “Invent to Learn”, outlines some of the major contributions Seymour Papert shared with our community. To prepare for this blog post, I also reviewed a speech Papert presented entitled “Constructionism vs. Instructionism.” I have tried to outline some of the key considerations given by Papert as we form a new vision for our schools that foster creativity, curiosity, and personalized learning. Epathy in schools: Dr. Stager celebrates Papert’s spirit of epathy in schools. Kids learn differently. To the 21st century school, he challenges schools to find ways to leverage the strength of a child’s learning style by giving students options and environments for learning. Project based learning and flipped classroom trends echo this idea. Engagement through knowledge application: Papert remarked that we love to learn ideas that have relevance and utility. Situational cognition notes that we tend to learn concepts more profoundly when we can immediately apply the new concept. In Papert’s theory of constructionism, he challenges us to create environments and situations where children learn to construct their own knowledge by positively constructing physical things. He also felt that computers provided a platform for students to construct and experience their ideas. Robots for Learning: Lego Mindstorms is named after the book “Mindstorms: Children, Computers, and Powerful Ideas” by Seymour Papert. Papert recognized early that robotics technology can be a platform for students to experience and learn math. 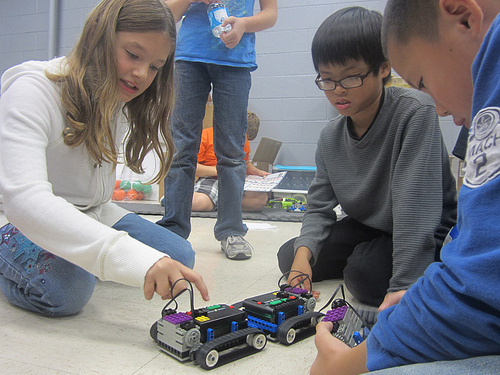 While math can be dry, children tend to be curious about robots. Promoting contexts for learning: Papert sought to bring math education to life. He proposed the creation of a “MathLand”, a set of environments and contexts enabling students to experience and experiment with math. In his mind, he wanted to see kids program the computer. He didn’t want computers programming our kids. This idea also shows up in Papert’s invention of the LOGO, one of the first programming languages for kids. It seems like virtual environments like OpenSim and Minecraft have the potential to become a MathLand for students. In Papert’s view, math and computer science should be invisible. Let’s say you see a poet writing in a park. You interrupt his writing process to ask him “what are you doing?” He is probably not going to talk about his pen and paper. The poet is more likely to share the ideas from the poem. Papert saw that math and computer science are tools to empower the creativity and genius present in every person. He challenged our community to place emphasis on growing the craft of thinking, crafting and growing that creative potential. The goal is to foster the learning potential of the student person. How do we use math and computers as a means of empowerment? Not an end.